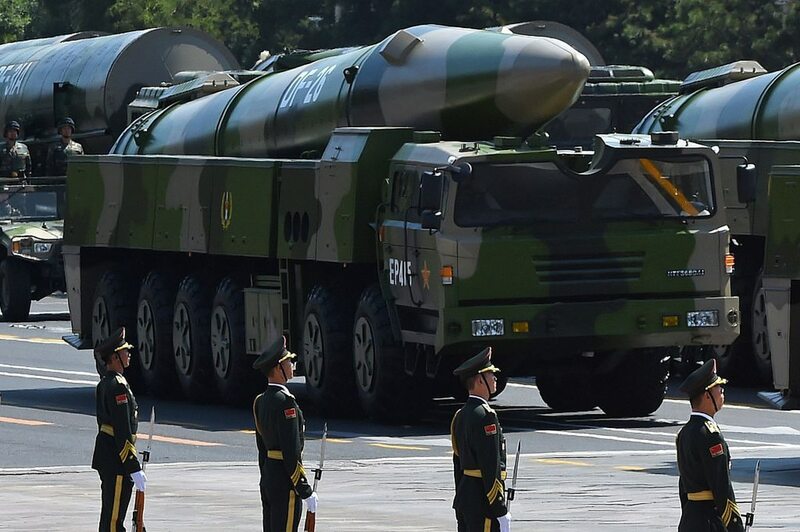 BEIJING — China’s advanced DF-26 intermediate-range ballistic missile has been incorporated into its rocket force, boosting its ability to counter opponents on land and at sea, a defense ministry spokesman said Thursday. The missile is capable of lofting both conventional and nuclear warheads, the latter to carry out a rapid retaliatory strike, ministry spokesman Wu Qian told reporters at a monthly news briefing. The missile is believed to have a range of up to 4,000 kilometers (2,500 miles), leaving vulnerable the crucial U.S. military installations on the island of Guam, along with other bases in the region. Despite that, Wu said China remained firm in its defensive military posture, including a policy of never launching a nuclear first strike against an opponent. China’s missile force is largely designed to degrade Taiwan’s defenses in a move to conquer the self-governing island, while holding off U.S. military support. Included in the arsenal is the DF-21D, which is built to take out an aircraft carrier, and a new air-to-air missile with a range of some 400 kilometers (249 miles) that could attack assets such as early warning aircraft and refueling tankers crucial to U.S. Air Force operations.